Color Vote is an app dedicated to transform your smartphone in a full-screen colored card. It can be useful to display a colored "vote" in any handheld vote situation in a public place, where color is prevalent. For example, it can be used in a quizz contest situation with friends in a pub, or in a scolar quizz contest. Another possible use would be in a improvisational (improv) comedy competition, for the color vote at the end of a round. Originally, I conceived this solution for a colleague which needed this app for quizz sessions with friends, but I also discovered it could be useful in other situation where a color vote is needed. 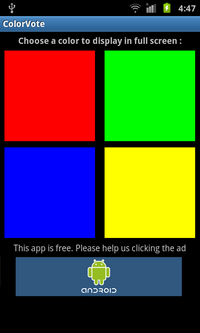 Color Vote presents, by default, a grid of four colored cards on the smartphone screen. If you press the smartphone screen on one of the four cards, the color of the selected card will be displayed full-screen. If you press again the screen, you will return to the selection screen with the four cards. You can change the number of displayed cards, switching the grid to two, three, five or six cards instead of four. The colors of the cards can be changed too. 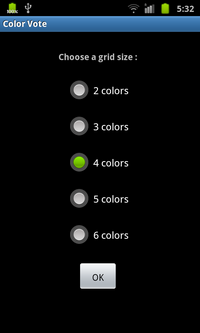 two "change color" modes : colors can be modified using a color picker, or entering number codes to share easily the same range between devices, if needed. 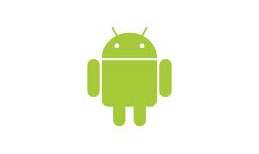 Color Vote has been tested on Android 1.6, 2.x, 3.x, 4.x, 5.x, 6.x, 7.x devices. Tests on Android 8.x are currently in progress, but as the early results show, the app should work fine too. 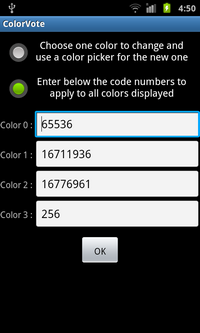 The current version of Color Vote is designed to work on 2.3.x (and above) devices, but a older compatible version with Android 1.6, 2.0.x, 2.1.x and 2.2.x, with all the main functions, is still available when you download the app from Google Play. These permissions are only designed to enable the ad banners to work (see the FAQ page for more details).